Joyelle McSweeney is the author of eight books of poems, fiction, drama and essays. Her writing chases an exuberant sound-infused hyperdiction through an array of genres, conventions, personae and forms. Her poetry books include The Red Bird, The Commandrine, and Percussion Grenade, all from Fence, and her prose books include Nylund, the Sarcographer and Salamandrine, 8 Gothics, both from Tarpaulin Sky, plus Flet from Fence. Her verse play, Dead Youth, or the Leaks, won the inaugural Scalapino Prize for Innovative Women Performance Artists and was published by Litmus in 2014. 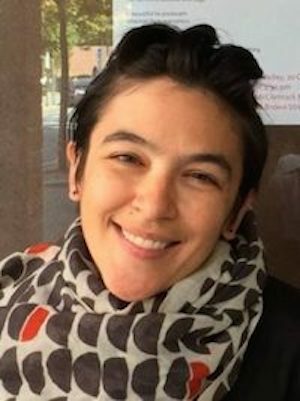 Her most recent book, The Necropastoral: Poetry, Media, Occults, was published by the University of Michigan Poets on Poetry Series in 2015. McSweeney is the co-founder of Action Books and teaches at Notre Dame. Black Warrior Review: Several years ago, I was obsessively reading Hannah Weiner’s Open House and one of my friends tipped me off to your monologues mashing up poet Hannah Weiner and sharpshooter Annie Oakley into a gleefully twisted hybrid, “Hannie Oakley.” It was so ham in the best way. I remember reading these and the rest of your book Percussion Grenade out loud to myself and feeling wonky and louche, like I was exercising drunk, and I was mad at myself that I didn’t know about your work sooner. It was my introduction to writing that doesn’t just play with formal conventions and genre, but seemingly seeps and spreads across everything at once, totally new and unique, yet hauntingly familiar. Even your academic work reads like poetry at times. From plays to novels to criticism, you’ve written it all, and each iteration is immediately and unmistakably identifiable as yours. What do you find generative about taking up multiple modes of writing, and how do you decide what “form” your work will take? Joyelle McSweeney: First of all, Shelley, it’s amazing to hear that my work had such a wild effect on you! A few years ago, sitting around sulking in Indiana, I got this question in my head: Where is Art Going and Where Has It Been? I still don’t know the answer to that question, but just thinking of Art as something in motion, sweeping through medium after medium, person after person, language after language, has freed me up to think of Art in a much more antic, electrifying, mediumistic, possessed and non-possessive way. I think that’s how Art works—it comes from someplace (where?) to the artist, and makes a medium of her, and then it pushes on someplace else—to you, in this case—wherein it mixes with all the materials and experiences and chemicals you’re made up of and generates still more spectacular effects. It’s like that other Shelley wrote in “Mont Blanc”—“ The everlasting universe of things /Flows through the mind, and rolls its rapid waves,/Now dark—now glittering—now reflecting gloom— “ etc. In the first burst of writing I don’t make too many decisions, but then, yes, I do a lot of shaping to bring out the sentences, the syntax, the voices, the diction, the form the work seems to want to take. I mean, I could never explain ‘why’ I wrote a mash-up of Annie Oakley and Hannah Weiner—except maybe that I was just powerfully affected by her silent teachers’ habitual exhortation, ‘Go to countdown!’. At my luckiest, I feel constantly exhorted by Art. BWR: This is sort of an extension of the last question, and it’s one that our fiction editor asked Nicola Griffith, whose response I adored. What do you see as the driving force behind your writing? JM: See above, I think! Art itself pushes in and makes more of itself. It makes its deranged and darling and devilish copies that stop the show, disrupt ‘normal’ function, overrun the shop. I think of Sound this way, too—Sound arrives (where is it going? where has it been?) and sets one’s membranes aflutter and wants to make more of itself. I try to welcome sound into my frilliest membranes. BWR: Do you have any unique writing habits, routines, or rituals? JM: I try to be reading multiple things at once—and they always converge, diabolically enough!—and I let their strange consonances and dissonances make strange squawking noises, and I try to voice those noises. See next question! BWR: What have you been reading lately? JM: Well I recently read Cotton Comes to Harlem by Chester Himes (one of the most exquisite novels I have ever read, so odd, smart, surreal, and stiletto-sharp! ), Derrida on Plato’s Pharmacy (Writing as drug! Writing’s dubious intentions! ), some big art catalogues about the early twentieth century Swedish visionary artist Hilma af Klimt(cannot be paraphrased—Google! ), History of Violets by Marosa di Giorgio (trans. Jeannine Marie Pitas), and Edward II by Christopher Marlowe (still can’t believe this play even exists). So you can see I have a ‘mashup sensibility’ in what I like to read and I like to set it all humming in and out of time with each other. BWR: What books do you find yourself returning to for pleasure, instruction, or kinship? BWR: Action Books has been such a vital contribution to the publishing landscape, introducing myriad international writers to an audience that is largely unaware of work happening outside of the U.S., in addition to celebrating translation itself. I remember a few years ago reading my first Action titles on a trip home for the holidays—Kim Hyesoon’s Sorrowtoothpaste Mirrorcream, Lara Glenum’s Pop Corpse!, and an older Abe Smith book, Whim Man Mammon—I was sipping a teensy airplane drink or two, and it all felt so decadent and melodramatic, but also urgently instructive, which gave me an overall impression that this stuff was quite literally prophetic. What would you say is Action Books’ relationship to the sibylline, to realms of the ghostly antique, to occult transpositions of the present, toward future horizons? JM: I think you nailed it pretty well in that last sentence, Shelley! We want Action Books to be a site for all those things to flame out like shining from shook foil. We publish works wherein aesthetic urgency is political urgency, works of sinister twinship, works written with a double hand—the author’s + the translator’s. Our works are anti-binary yet crammed with super-imposition and paradox. It’s all just a fetid, vibrant, radiant, radical mishegas. That’s what allows it to work unpredictably and fantastically on readers, I think! Some folks do not like this flavor of dubious candy, but I don’t think anyone can deny it is a distinctive one. BWR: What would you be excited to encounter in a flash prose contest entry? JM: I would like it to effect me like the best and most dubious of blister-pak’d capsules: gelatin, rabbit fur, and champagne. BWR: You were scheduled to give a reading and a talk at UA, but a series of tornado watches here stranded you in the Atlanta airport, I believe, which made me think of your essay on the cringe-worthy “Light Tunnel” in the Detroit airport (where I’m from), and I wondered if there was at least some equally interesting and horrifying piece of art at the Atlanta airport to distract you from the endless delays. Anyway, you had planned to talk about your recent work on the connections between the toxic and the lyric, so I was hoping you could say a bit about that here. JM: Well I’ve been ensorcelled by Derrida’s reading of Plato’s Pharmacy, of writing as pharmakon, as essentially dubious, as its own evil twin—writing as drug and as remedy. I think our current environment is universally toxic, but some are insulated from the toxins; the toxins (of violence, racism, sexism, classism, ableism, colonialism,- xenophobia, anti-queer and –trans-ism) accrue in and harm some bodies far more greatly than others. In this environment of absolute toxicity, it is tonic (and dangerous!) to think of Art as crime, as drug, as something bio-identical to that which harms us, as something that can alter and damage us and make us ecstatic and convert us into something new—or Art as something which, like reality, we might not survive. I’m wondering if the lyric might be this kind of dubious, super-potent, fascinating drug. But I actually started thinking of this because I was contemplating the bacteria that killed Keats. BWR: Lastly, who are some “emerging” writers you’d like to give a shout-out to, and encourage our readers to explore? JM: If you want to read works in the prose-poetic vein which will flip your lid, check out Sade Murphy’s Dream Machine and Steven Dunn’s Potted Meat; if you’re also interested in not-‘emerging’-but-newish- to-US/Anglophone-readers, check out Marosa di Giorgio (a large selection translated by Jeannine Marie Pitas coming our from Ugly Duckling this Fall! ); Yi Sang’s Wings (in whatever translation you can find); Aase Berg’s Hackers (trans. Johannes Göransson), Estilo/Style by Dolores Dorantes trans. Jen Hofer... Well I could go on and on…. Click here for more information about our flash prose contest.